Yesterday, Chicago Cubs player Tyler Colvin was stabbed by a flying broken bat. He was impaled below the collarbone as he was scoring from third on a broken bat double by Welington Castillo. Colvin was watching the ball in the outfield and didn’t see the bat flying towards him. I watched the video on television and it was frightening when Colvin revealed his wounded chest as he was walking back to the dugout. For years fans have talked about this possibility. The talk usually goes something like this: **broken bat** “Y’know, one of these days a player or a fan in the crowd is going to get stabbed in the chest from one of these broken bats”. Hopefully this Colvin incident will raise awareness among the media and within Major League Baseball. And that’s why I’m blogging about this now. Maple bats should be banned from Major League Baseball. The bat that stabbed Colvin was made from Canadian maple. Maple breaks much easier than other types of wood. There also should be stricter restrictions on the diameter of bat handles and bat heads. Colvin is fortunate he wasn’t stabbed in the lung or stabbed in the heart. This is a serious matter that should be addressed immediately to best ensure the safety of the lives of the players and fans in the crowd. And yes, I call it a stabbing. Merriam-Webster defines “stabbing” as “to wound or pierce by the thrust of a pointed weapon” or “to thrust or give a wound with or as if with a pointed weapon”. 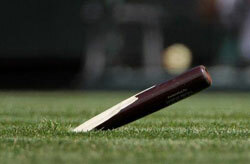 When Major League Baseball allows the use of maple in bats which splinters easily, then such splintered bats should be considered to be flying weapons which endanger the lives of players, team members, fans, and employees of the team. Below is a collection of news stories related to the Tyler Colvin stabbing and their choice of headlines. Olbermann actually provides screen captures of the stabbing. Excellent work, Mr. Olbermann. This headline really ticks me off. I’m a life-long Cubs fan, but who cares about wins and losses when a player was about 6 inches away from potentially being killed. To the tribune, this potentially deadly event was simply a “damper” on the Cubs winning streak. I love seeing the Cubs win, but let’s get real. nbcchicago.com (NBC Chicago): Cubs’ Tyler Colvin Impaled by Broken Bat. I’m really upset about the voting on this site. People can tag stories on nbcchicago.com as one of the following, “sad, laughing, intrigued, furious, thrilled, bored”. Here’s the breakdown when I checked this page: 59% sad, 24% laughing, 9% intrigued, 6% furious, 3% thrilled, 0% bored. This reinforces why I can’t stand White Sox fans. For the record, I am part of the 6% furious. Furious because Major League Baseball hasn’t enforced stricter standards on their bats.